By the spring of 1943, Canadians sailors and airmen had gained a considerable amount of battle experience, but the Canadian Army, stationed in Great Britain, had not been involved in any large-scale land operations. The need for battle experience and the growing public demand for action led to the decision to include the 1st Canadian Infantry Division and the 1st Canadian Army Tank Brigade in the assault on Sicily. This was to be the prelude to the invasion of mainland Europe. The invasion was to be carried out by the Seventh U.S. Army under Lieut.-General George S. Patton, and the Eighth British Army under General Sir Bernard L. Montgomery. The Canadians were to be part of the British Army. Under the command of Major-General G.G. Simonds, the Canadian troops sailed from Great Britain in late June. En route, 58 Canadians were drowned when three ships of the assault convoy were sunk by enemy submarines, and 500 vehicles and a number of guns were lost. Late on the night of July 9, the Canadians joined the invasion armada of nearly 3,000 Allied ships and landing craft. Just after dawn on July 10, the assault (preceded by airborne landings) went in. The Canadians, forming the left flank of the five British landings that spread over 40 miles of shoreline, went ashore near Pachino close to the southern tip of the island. The Americans, meanwhile, established three more beachheads over another 40 miles of coast. 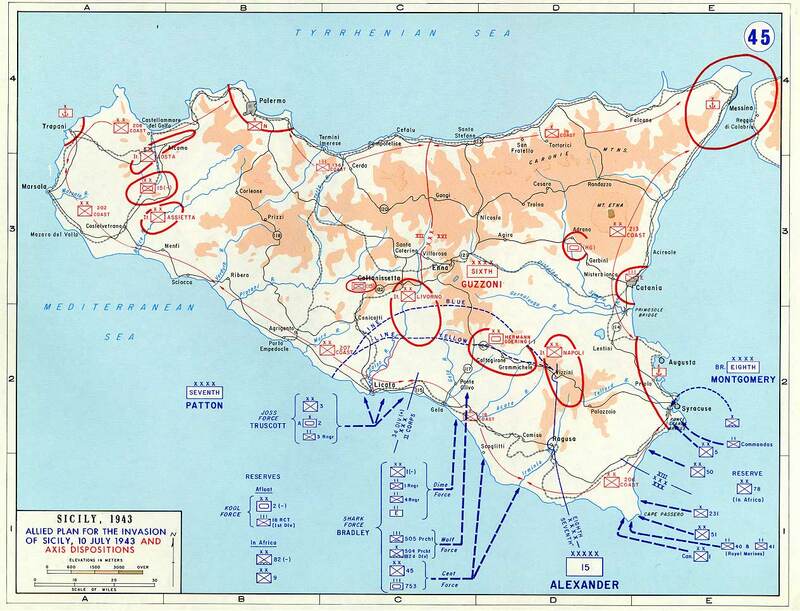 In taking Sicily the Allies aimed, as well, to trap the German and Italian armies and prevent their retreat across the Strait of Messina. From the Pachino beaches, where resistance from Italian coastal troops was light, the Canadians pushed forward through choking dust, over tortuous mine-filled roads. At first all went well, but resistance stiffened as the Canadians were engaged increasingly by determined German troops who fought tough delaying actions from the advantage of towering villages and almost impregnable hill positions. On July 15, just outside the village of Grammichele, they came under fire from Germans of the Hermann Goering Division. The village was taken by the men of the 1st Infantry Brigade and tanks of the Three Rivers Regiment. Piazza Armenia and Valguarnera fell on successive days, after which the Canadians were directed against the hill towns of Leonforte and Assoro. The defensive advantages of the mountainous country led to bitter fighting, but both places fell to the Canadian assault. Even stiffer fighting was required as the Germans made a determined stand on the route to Agira. Three successive attacks were beaten back before a fresh brigade, with overwhelming artillery and air support, succeeded in dislodging the enemy. On July 28, after five days of hard fighting at heavy cost, Agira was taken. Meanwhile, the Americans were clearing the western part of the island and the British were pressing up the east coast toward Catania. These operations pushed the Germans into a small area around the base of Mount Etna where Catenanuova and Regalbuto were captured by the Canadians. The final Canadian task was to break through the main enemy position and capture Adrano. Here again, the Canadians faced not only human enemies, but physical barriers as well. The rugged, almost trackless country meant that mule trains were required to bring forward mortars, guns, ammunition and other supplies. Nevertheless, literally fighting from mountain rock to mountain rock, the Canadians advanced steadily against the enemy positions. With the approaches to Adrano cleared, the way was prepared for the closing of the Sicilian campaign. The Canadians, withdrawn into reserve on August 7, did not take part in this final phase. Eleven days later, British and American troops entered Messina. Sicily had been conquered in 38 days. The Sicilian campaign was a success. 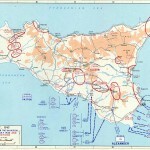 Although many enemy troops had managed to retreat across the strait into Italy, the operation had secured a necessary air base from which to support the liberation of mainland Italy. It also freed the Mediterranean sea lanes and contributed to the downfall of Mussolini, thus allowing a war-wearied Italy to sue for peace. The Canadians had acquitted themselves well in their first campaign. They had fought through 150 miles of mountainous country – farther than any other formation in the Eighth Army – and during their final two weeks had borne a large share of the fighting on the Army front. Canadian casualties totaled 562 killed, 664 wounded and 84 prisoners of war. The next great operation was to be the invasion of the Italian mainland.